Attack of the Clones vaulted all of the characters from The Phantom Menace forward by ten years, leaving a gap for fans to wonder what happened in that time period to each of them that returned. One of the biggest changes was for Padmé, who had gone from being Queen of Naboo to its representative in the Galactic Senate on Coruscant. E.K. Johnson has now given fans something they have wanted for years, a book devoted to Padmé, her handmaidens and the time transitioning from planetary to galactic politics. The strongest point of Queen’s Shadow is the way Johnson is able to flesh out the relationships that we see Padmé have with other senators in The Clone Wars as well as Attack of the Clones and Revenge of the Sith. In The Clone Wars, we were introduced to people from Padmé’s early days as a senator like Rush Clovis and Mina Bonteri, which Johnson is able to finally illuminate their first interactions. There is little more exciting than seeing the connective tissue between the films and the animated series made tighter. Other relationships from the senate are highlighted as well. We are shown why Bail Organa and Mon Mothma become some of Padmé’s closest allies in the senate. It goes a long way to understanding just how close the Organa’s were to Padmé, so that when they take Leia as their daughter in Revenge of the Sith, you can think of no one better to raise her. It also helps with understanding why Leia would feel like she felt her mother as a very young child, since her mother had been to Alderaan and stayed in the palace before, which one assumes was not just a one time visit. Johnson is also able to make the connections to the milieu of galactic politics which leads to what is seen in Episodes II and III. She shows the way that Palpatine is already starting to control things, behind the scenes, as he keeps Padmé away from the anti-slavery committee, knowing that if she’s there, she’ll move things in a direction he doesn’t want. Johnson also shows how relevant the Prequels are as she accentuates the problems of galactic politics that’s swayed more by factions, news outlets and self interest more than what is right. The last major connection is that of the handmaidens. Johnson is finally able to show the interworking of this group that should satisfy the most ardent Padmé fan. The way this group to talented and dedicated women work together to protect and take care of Padmé and each other is inspiring. By the end of the book, the story does come together well, but the way that it gets there is not as cohesive as it could be. Even half way through the book, it seems to lack a clear through-line, story wise. In many ways, it feels more like vignettes from Padmé’s first year as a senator than a connected story. The thematic elements of Padmé transforming from queen to senator are there and done well, but something just feels like it’s missing. The best example of this is the story about slavery on Tatooine, which feels like it will be a major thrust of the story early on and then just peters out unsatisfyingly. The book also has an ending that makes you think there will be a sequel, but also doesn’t feel like it fits completely with how the main trust of the story wrapped up. In all, Queen’s Shadow is an enjoyable read that allows fans the opportunity to understand better the character of Padmé, who she is in The Clone Wars and beyond. In fact it even helps lay the foundations for her emotionally, that explain the why and the how of her relationship with Anakin. It’s this, on top of the connections made with other parts of the Prequel era that lead to a rating of 3 out of 5 stars. This entry was posted in Book Reviews, Books, Disney, Star Wars, The Clone Wars, Uncategorized and tagged Book Reviews, Books, Disney Publishing, Handmaidens, Padmé, Star Wars, Star Wars books, Star Wars: The Clone Wars on March 5, 2019 by mrushing02. This review originally appeared on The Star Wars Report. Don’t miss The 602 Club review! Vader’s ruminations are the perfect summation of Timothy Zahn’s latest book Thrawn: Alliances, which explores the first the meeting of Anakin Skywalker and Thrawn as well as a mission Vader and Thrawn are sent on by the Emperor. Loyalty is tested and secrets are uncovered as the Unknown Regions become the backdrop for two events that will help shape these men’s lives forever. The other thing Zahn does well is the way he weaves the mysteries of each story and the implications they have on the prequel time period and possibly the sequel era. The Clone Wars era story adds one more layer of machinations of Palpatine, adding dimension to his plans for bringing down the Republic. The Imperial era story continues to build on the mysteries of the Unknown Regions, races there, the Chiss Ascendancy and what the Emperor could be so interested in. This may be the most intriguing part of the story and it’s one that leaves the reader clamoring to know more and with the hope that all this focus on the Unknown Regions is going to pay off in the future. Thrawn: Alliances is a book that much could be written about, but as a review, it’s honestly best left to the reader to discover. Zahn has created something wonderful here, so should you buy it, yes! Warning, it’ll leave you hungry for more, but isn’t that the hallmark of a good Star Wars book, opening the door for more? Thrawn: Alliances is rated 4.5 out of 5. This review was completed using a copy of Thrawn: Alliances provided by Del Rey. This entry was posted in Book Reviews, Books, Star Wars, Star Wars Rebels, The Clone Wars, Uncategorized and tagged Book Reviews, Books, Del Rey Books, Star Wars, Star Wars books, Star Wars Rebels, Star Wars: The Clone Wars, The Clone Wars, Timothy Zahn on July 24, 2018 by mrushing02. George Lucas: A Life by Brian Jay Jones. George Lucas is one of the most enigmatic and fascinating people in Hollywood, although he’d probably resent that statement as his whole life has been about not being part of they Hollywood system. In this new, non-authorized biography, Brian Jay Jones traces Lucas’ quintessentially American story from humble beginnings to titan of the film industry. The book is split in to 3 parts, Hope, Empire and Return, each on taking on a different part of George’s life and doing their best to synthesize a very full existence in a mere 550 pages (really only 470 as the last 80 pages are notations). Hope is actually the the best section of the book, chronicling Lucas’ family and his early life as a greaser who found school boring and working for someone else even more so. This is the most formative section of the book, much of who Lucas became would be a direct result of things that happened during this period. The issues with his father (which would play in in his two biggest franchises), his desire to be completely free to do things his way and a car accident that would illuminate the truth of life’s fragility cementing his character. The reason for most everything else Lucas would do in his life could be traced back to his beginnings in Modesto, California. Empire tells of Lucas’ fortunes after American Graffiti as he struggle to bring his idea of The Star Wars to screen. Next to his youth, this is the the most integral to who Lucas would become. His experiences with THX-1138 and American Graffiti would set him on course to chart a future away from the influence of the studio and Hollywood system. Everything he did was a move to allow him to make movies without compromising his artistic creativity as well as building a place where others in the industry would be able to do the same. This same drive would also cost him dearly, as he neglected his wife in favor of making his movies and the neglect would cost him his marriage. Return recounts the journey from the Original Trilogy to the Prequels and the sale of Lucasfilm to Disney. It’s the weakest section of the book, feeling too condensed and too reliant on the most superficial understanding of the Prequels as well as the work that truly went into them. It sadly glosses over the importance of The Clone Wars series as well, making it feel more like a footnote than the project that helped Lucas fall in love with Star Wars all over again. Also left out is the fight with Marin County which lead Lucas to giving up his dream of making the Star Wars sequel trilogy himself and the resignation of selling the company to Disney. The one true strength in this section is the way it highlights the correlation between Lucas, his divorce and the story of the Prequel Trilogy, especially, Anakin and his choices. After reading this book one can see how much of himself he actually poured into the story. Anakin and Lucas both have the same fall on their way to Empire-building. With the strength of the first two sections the book is recommendable, yet it’s not without it’s faults. Frustratingly the last section does devolve into most every criticism of Lucas in the Special Edition to Disney sale that everyone has surely read online. Honestly this can be attributed to the non-authorized nature of the book and the lack of interviews, which would have helped the last section of the book specifically. Peter Jackson is quoted in the book saying about Lucas, “I can’t help feeling that George Lucas has never been fully appreciated by the industry for his remarkable innovations…He’s the Thomas Edison of the modern film industry.” In some ways the book leaves one feeling this way as well. Lucas’ accomplishments in film, his tireless struggle for innovation and consistently putting his hard-earned money where his mouth is, should be given more due. Hopefully this is just the beginning of books to come out about Lucas and here’s to hoping the next is even more in depth, but Jones’ book is a good place to start and is rated 4 out of 5 Death Stars. This entry was posted in Book Reviews, Books, Film, George Lucas, Movies, Star Wars, The Clone Wars, Uncategorized and tagged Book, Book Reviews, Film, George Lucas, Indiana Jones, Movies, Star Wars, The Clone Wars on December 23, 2016 by mrushing02. In 2008 Star Wars fans were introduced to a brand new character that no one expected, Anakin Skywalker’s padawan, Ahsoka. She immediately polarized the fan community and it took years for some people to warm up to her. Fast forward to March 7th, 2014 where she walked away from the Jedi order in the last broadcast episode of The Clone Wars, breaking fans hearts but also relieving them as they knew Ahsoka lived. Now, with her fate in the balance once again, fans can’t get enough Ahsoka and they’ve got a new book to keep us satiated. In this supplemental episode of The 602 Club host Matthew Rushing is joined by fellow Jedi Masters Bruce Gibson and John Mills to talk about the new Star Wars book, Ahsoka. We first discuss the Lando casting, our expectations coming into the book, the end of Ahsoka’s world, interludes, becoming something else, the Imperial way, stormtroopers of clones, kyber crystals, Inquisitors, a failing order and our ratings. This entry was posted in Ahsoka, Book Reviews, Books, Podcasts, Star Wars, Star Wars Rebels, The 602 Club, The Clone Wars, Uncategorized and tagged Ahsoka, Book Reviews, Books, EK Johnson, Star Wars, Star Wars Rebels, The Clone Wars on October 24, 2016 by mrushing02. I have recently begun a new podcasting adventure with my good friend John Mills called Aggressive Negotiations. It is a Star Wars podcast and yet not your usual Star Wars show. We do not cover any news or current Star Wars evens, we cover the things you talk about with your friends. We are just two guys who enjoy contemplating the silly, the serious and everything in-between about the Star Wars saga. I hope you will join us for our 30ish minute shows as we talk about a fun new topic each week. You can find us on our website as well as iTunes. Check us out, let us know what you think and help spread the word! This entry was posted in Podcasts, Star Wars, Star Wars Rebels, The Clone Wars, The Force Awakens, Uncategorized and tagged Podcasts, Star Wars, Star Wars Rebels, Star Wars: The Clone Wars, The Force Awakens on February 2, 2016 by mrushing02. As May 19th 2005 approached, Star Wars fans eagerly awaited what was believed to be the last film in the Saga. The end had come and the only question was whether it coould satisfy the imaginations of a generation. In this episode of The 602 Club host Matthew Rushing is joined by Jedi Masters Bruce Gibson and John Mills to talk about Revenge of the Sith. We discuss our Episode III experiences, the end, personal themes, the fall of Anakin and the Republic, speculation about Episode VII, in light of The Clone Wars, Mustafar scene, missing scenes and our ratings. This entry was posted in Film, George Lucas, Movie Review, Movies, Star Wars, The Clone Wars and tagged Film, George Lucas, John Mills, Movie Review, Movies, Podcast, Revenge of the Sith, Star Wars, The Clone Wars, The Prequels, Trekfm on September 3, 2015 by mrushing02. When Disney purchased Lucasfilm in the fall of 2012 it marked the end of The Clone Wars. It was as if millions of voices suddenly cried out in horror, yet instead of being silenced, they have only continued to speak strongly, with the hashtag #SaveTheCloneWars still a staple of Twitter to this day. Since it’s demise, Dave Filoni and Pablo Hidalgo have worked tirelessly to find the best venue for all the displaced stories that were in development. The Lost Missions were released on Netflix, there have been two releases of arcs on StarWars.com in animatic form, as well as a comic book chronicling more of Darth Maul’s story. It is no surprise that one of these untold stories has found it’s way into a novel. 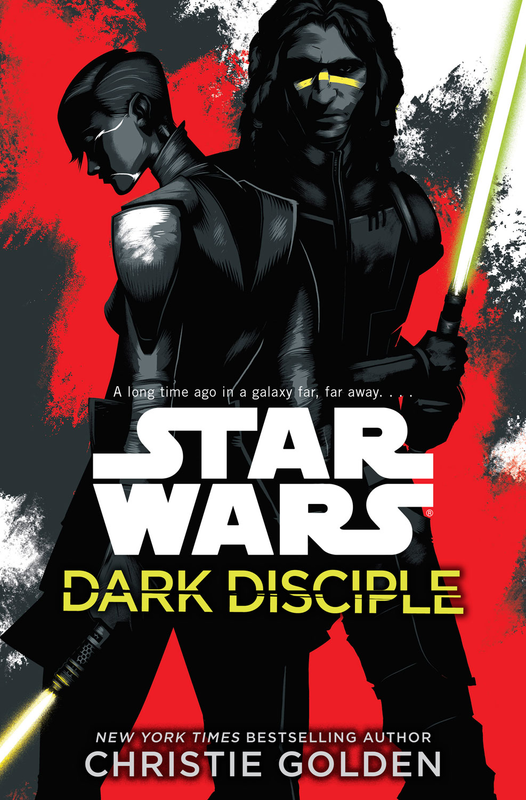 The newest edition to Star Wars canon is Dark Disciple by Christie Golden, which was to have been an eight part arc in an upcoming Clone Wars season. It follows up on the character Quinlan Vos who is tasked by the Jedi Council to assassinate Count Dooku after he commits near complete genocide. Vos’ mission is to secretly recrute discarded assassin Asajj Ventress to take out the Separatist leader at all costs. What follows is a tale of darkness, deception, hope and ultimately redemption. One of the strengths of The Clone Wars has been the way it fills in the gap between Episodes II and III. Lucas has mentioned before that in the course of the Skywalker saga there was not the time to dive into the war itself. The Clone Wars does a spectacular job at showing the slow slide down the slippery slope that the Jedi have been put on as war was thrust upon them, They have gone from keepers of the peace to soldiers, in a war that has been manufactured as their doom. Dark Disciple is one of the finest examples at how far the Jedi Order has been eroded by the war. It has begun to chip away at their morality and connection to the light. They are willing to put aside what they know is right for a chance and victory, yet the price may be more that they can bare. The road to hell is paved with good intentions and that is the case here as the Jedi Council authorizes a dark mission for Quinlan Vos to enlist the help of Ventress through deception to assassinate Count Dooku. Irony of it all, the greatest proponent on the Council is Windu who once defended him to Padme by saying, “You know, My Lady, Count Dooku was once a Jedi. He couldn’t assassinate anyone. It’s not in his character.” Unfortunately the war has created an atmosphere for the Jedi where what was once unthinkable has become tolerable or even acceptable. The corruption of the Jedi is almost complete. It’s a powerful reminder of just how easy it is for the truth to slip away from us, even when we think we are doing the right thing. Circumstances cannot craft right and wrong as the Jedi learn here. Embracing even the smallest amount of the the dark side can destroy lives. One of the greatest character arcs in The Clone Wars is that of Asajj Ventress. At the resent Star Wars Celebration, Dave Filoni mentioned that Lucas was not happy having Ventress as an acolyte of Dooku. George felt like her story would be much stronger if she were to make her own way and boy was he right. The last time Ventress was seen in the show she had assisted Ahsoka who was on the run from the Jedi Order. Her character had already begun to turn from the darkness in the Darth Maul arc from season 4 where she saved a young girl who was about to become a slave wife. As Dark Disciple begins Asajj is still working the bounty hunter scene, going it alone when Vos shows up. As they begin a fledgling partnership, she begins to open her heart to the possibility that she could have more. The most powerful theme in the book becomes the redemption of Ventress, a character who has been to the brink of the abyss and clawed her way back. It is her love of Vos and her willingness to embrace the way of the light that enables her to sacrifice herself for another. She lives out the words of Jesus when he says, Greater love has no one than this, that someone lay down his life for his friends.” The affect she has on Vos and Obi-Wan is profound. Obi-Wan specifically points out to the Council the error of their ways and just how much they can learn from Asajj. They have lost their way and turned to the dark side for answers, but is it though the light that the true power comes. This story brought tears to my eyes as it illustrated the beautiful truth that no one is beyond redemption. Most of the time, people only lack the light to show them the way so it is our job to love those that others might see as unlovable. It is only through self sacrificial love that this can happen. People are not won by words but by actions and there is nothing more powerful than true love at work. Another fascinating about Dark Disciple is the way Kenobi and Yoda seem to be setting themselves apart from the rest of the Jedi. Both of them are uncomfortable about the idea of an assassination mission. 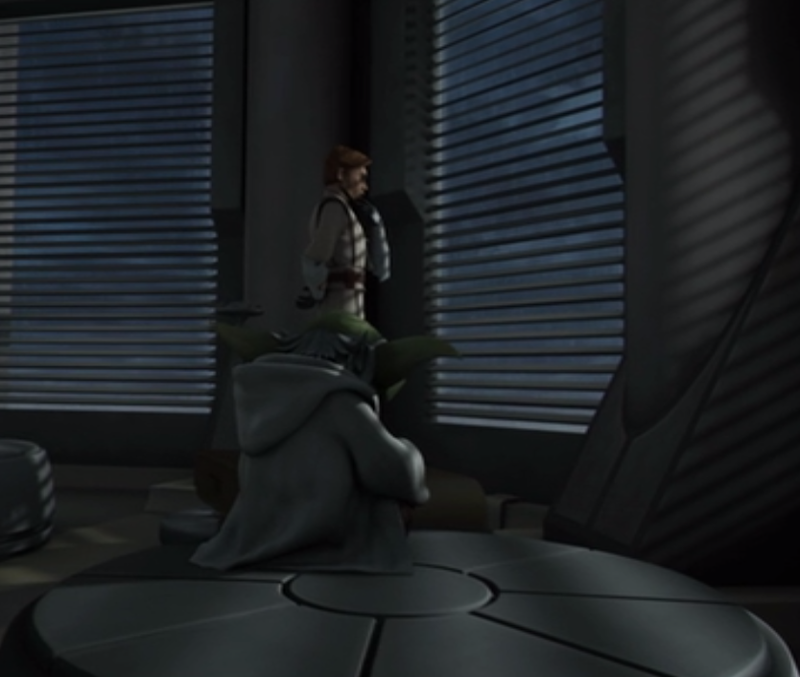 Kenobi voices strong opposition to the plan and even gets rather heated with Master Windu as the Council debates whether or not to pursue this dangerous idea. Kenobi seems to be channeling the defiance of Qui-Gon as he tries to steer the Council back towards the light. One character even remakes that Obi-Wan always strives to take the high road and see the best in people. As the book progresses it is Kenobi and Yoda that have the hardest time believing Vos could have fallen to the dark side. They seem to be the only ones that still have faith in the Jedi’s ways. Not only do they have trust in Vos but they also give that trust to Ventress as well. Kenobi and Yoda, again and again in this book portrays the very best qualities of the Jedi, fighting for what is right and trusting in only incontrovertible evidence about the guilt of a trusted friend. Christie Golden has written the finest book in the new canon with Dark Disciple. The book immediately feels like an arc of The Clone Wars. In many ways it is a stinging reminder of just how much life was left in this show and the power it had to tell amazing stories. My sincere thanks to Dave Filoni and Pablo Hidalgo for continuing to find opportunities to get The Clone Wars content to fans any way they can. Dark Disciple is now my gold standard for what this new line of canon books can and should be. This book is rated a perfect 10. And be sure to check out John Mills’ review who joined me for the discussion. This entry was posted in Book Reviews, Books, Faith, George Lucas, Kenobi, Star Wars, The Clone Wars and tagged Book Reviews, Books, Dark Disciple, Dave Filoni, ebooks, Star Wars, The Clone Wars on July 9, 2015 by mrushing02.